These tortillas are great for quesadillas or burritos (I guess you could even do “wraps” with them, as long as you use them warm, otherwise they’re not very flexible). They are moist and buttery, and even if they don’t come out perfectly round (mine never do! ), you can wow your friends and family! They are not as good as my mom’s, but they’re pretty close. Make a “hole” in the middle of your “mountain” of flour. Add oil and water and start mixing. When the dough is firm enough, knead it a bit on a flat surface. Make several round balls (called “testales”), and placed them on a floured surface (cookie sheet works great). Let the testales rest for about 30 mins. covered with a damp towel. Place a testal on a floured surface. Flour your rolling pin and roll. Whatever technique you use for rolling… just spread them enough so they are bout 6 inches in diameter. Just like with pancakes, the 1st one is never good, but the rest are delicious. You can pile up the uncooked tortillas, they won’t stick. My process is usually: flatten, place in comal, flatten another one, turn the one in the comal, flatten another one, remove the one from the comal and repeat! It takes about 1 minute to cook on the 1st side (you will see some bubbles appear on the surface, this is normal), then you turn and it takes about 30 seconds on the second side. Eat them warm, but to freeze or refrigerate, make sure you cool them spread out on a flat surface before bagging them. 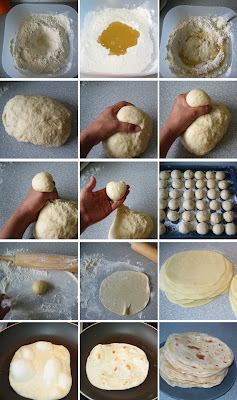 This entry was posted in Cooking and tagged cooking, mexican, torrtillas by shaoxilizheng. Bookmark the permalink.